If you've been through the other guitar chord lessons on this site, you'll be aware that there are two main types of chord - open chords (which use a combination of open and fretted strings), and barre/movable chords (which use all fretted strings). In this section, we're looking more at open chords and how you can "float" chord shapes right up the guitar neck, still utilising open strings. If you've never looked at this technique before, you'll be amazed at the kind of chords you can create simply by messing around with mixing open strings with movable chord shapes. I'll be showing you some more key examples, but the emphasis will become more and more on your willingness to experiment with different chord shapes and variations on your own, based on what you've already learned. Using open strings in chords gives them a kind of depth and vibrancy that can't be attained with regular, fixed-form chords. The simplest way to create such chords is to take an existing open shape, major or minor, and just move it around. 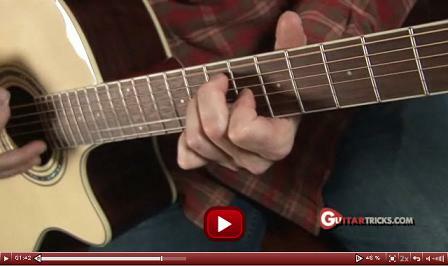 Click the diagrams and tabs in this lesson to hear. You can also float chords using the top 2 strings (e and B) open and move the root note of the chord with the rest of the shape. We have to ensure that the corresponding notes, E and B, are compatible with the chord we're floating. Let's start with a basic E shape major barre chord. 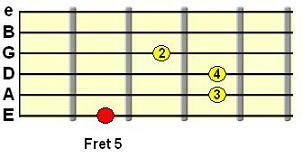 Playing it at the 5th fret creates the A major chord. So rather than barre across all 6 strings, we lift the index finger so it frets only the E string root note (red dot). The other fingers remain unchanged, leaving those top 2 strings to ring open. Click the diagram to take a listen. A nice, fuller alteration of the E form barre chord. It's actually Aadd9 in full, but we'll focus on the theory behind that some other time. At the moment, I just want us to focus on the new sounds we can create by altering these fixed-form chords to include open strings! We get another unique sounding chord. Because we're now at fret 2, it's an alteration of the F# barre chord (F#7sus4). Remember, we're treating each chord individually. They could all be used together in a chord progression, or they could be used with other chords. It's ultimately up to you when/if and how you use them. Once we get to the 12th fret, we're back at the standard E major position, but because the top 2 strings are still being played open, it gives it a rather different sound. So, that's the basic idea. Use open strings with partial chord forms to create a new sequence of notes and, therefore, a new variation of that chord. Tip: Practice your chord playing over backing drums to really bring out your creativity. You can download your very own drummer here. The idea is to draw from those familiar chord shapes we've learned in past lessons, cut them down, and float them up the fretboard with open strings to see what you can create. Floating this shape at fret 5 (making it an Amaj7 variation) sounds good (in my opinion! ), with the top 2 strings left open again. 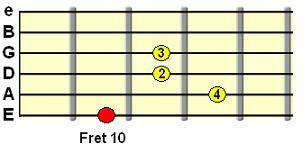 ...it also works at fret 3 (Gmaj7) and fret 7 (Bmaj7). Unfortunately I can't map out every possible position these chords work in! You should have fun discovering that for yourself. For example, try using a partial dominant 7th shape (from the earlier open chord lessons) and floating that with the top 2 strings open. Each one has a unique sound. So rather than, for example, using a regular A minor chord shape, you could use that cut-down minor shape from above (in the A minor position - f5th fret) for a more interesting voicing. Now, we can also float these chords with the low E string as one of the open strings! Logic has it that if the high E string has been compatible, then so will the low E string, as it's the same note. It does however give a very different feel to the chord, as you're essentially providing an E bass note. Try playing the sequence of "compatible" floating positions above, but this time including the open low E string. You can also try this technique with the major shapes from earlier in this lesson. The open low E string acts as an underlying bass note for any floating sequence you want to create using those positions. To finish with, I'm going to play a sequence of floating major and minor chords using that open low E string technique mixed with other forms we've learned in this lesson. Click the tab to hear. I hope this lesson has provided a solid introduction to the concept of open string chords. Now you can experiment and "mess around" with your own ideas and create chords you never could using the standard fixed-form shapes. Enjoy it. Next lesson we'll be looking at even more inventive ways to use this type of chord, so hopefully I'll see you soon!